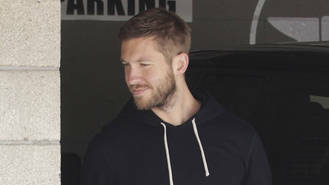 Calvin Harris is "free" of Taylor Swift. The 32-year-old DJ responded to comments on his Instagram account on Thursday (23Jun16) referencing his ex-girlfriend Taylor Swift and her quick rebound to actor Tom Hiddleston. He quickly deleted his remarks, but screenshots of his account taken by fans show the musician didn't hold back in his response to Taylor's new relationship. When someone asked him if he was jealous of the so-called 'Hiddleswift', Calvin wrote: "Not jealous sir, FREE." Taylor and Tom's relationship was revealed after pictures were published of the pair enjoying a romantic walk along the beach and a tender embrace in Rhode Island. There was some speculation that the pictures were staged, and Calvin appeared to confirm that as he alleged his former love "controlled the media and this situation. "I had no idea what was going on. So that kind of makes it a lot worse from my perspective." Following his split from Taylor, Calvin tweeted that he still had "love and respect" for the singer, but he deleted this message and unfollowed the Shake It Off singer on social media when he found out about her romance with Tom. However, on Wednesday (22Jun16), Calvin confused fans when he decided to refollow the singer once again. Asked why he had done that by one fan, Calvin replied: "I cared too much and then I didn’t care at all. I am a real person remember." Another of his remarks appeared to confirm that it was Taylor who had ended the relationship, with Calvin writing: "Bro I didn’t leave anyone and she’s def not sad. It’s all good." Calvin also praised a Taylor Swift fan account for their post which read, "For all we know Taylor broke up with him to be with another man and this is quite upsetting. I would be hurt by that too. He’s not being mean. He deserves to feel free while he’s single and not feel jealous." Calvin replied: "@butikeepswifting you’re the only smart one at this point." Matt Healy likes the "divisiveness" of his band The 1975. Jermaine Jackson's third wife has filed for divorce. Kylie Jenner has seemingly confirmed her relationship with rapper PartyNextDoor after locking lips with him in his new music video. Led Zeppelin have been cleared of plagiarising the intro for 'Stairway to Heaven'. Tom Jones' "heart stopped" when he found out his wife of 59 years had just a week to live. Matt Bellamy is "looking forward" to performing a stripped back set at Glastonbury Festival on Friday (24.06.16). Mary J. Blige has recorded a "crazy" song with Kanye West for her new album.